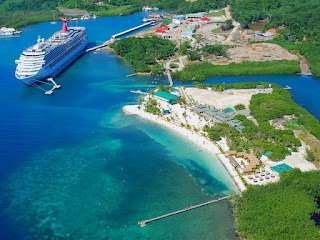 On a recent trip to Roatan, we decided to check out Mahogany Bay, Carnival's cruise ship port on the island. The cruise ship port in Coxen Hole can only handle 2 ships at a time so a few years back, Carnival spent $62 million on a new port that can hold 2 more ships. It is located east of the airport and encompasses some 18 acres. One afternoon, while we were out driving around, we decided to turn down the road to the port. However, when we got there, it was gated and closed as no ships were in port. Intrigued, we decided to come back on a day when there was a ship in and thus would be open. We got some good advice from the locals, go around 10 or 11 am when most of the cruise ship passengers were where they wanted to be. Any earlier and you ran the risk of running into mobs of people and tour buses, same with later in the afternoon when passengers were rushing to get back on board before the ship departed. So, one cruise ship day when we needed a break from the sun, we pulled down the road, and sure enough, the gate was open. We expected to be stopped by the guards as we had heard they are very strict about letting non cruise ship sanctioned tour guides in, but they just waved us through. We drove into the complex and parked. We took a short walk up to the main port area. The shopping area is set around a central square and offers duty free shopping with over 30 retailers. We were expecting the prices to be more expensive as they have a captive audience but we were pleasantly surprised. 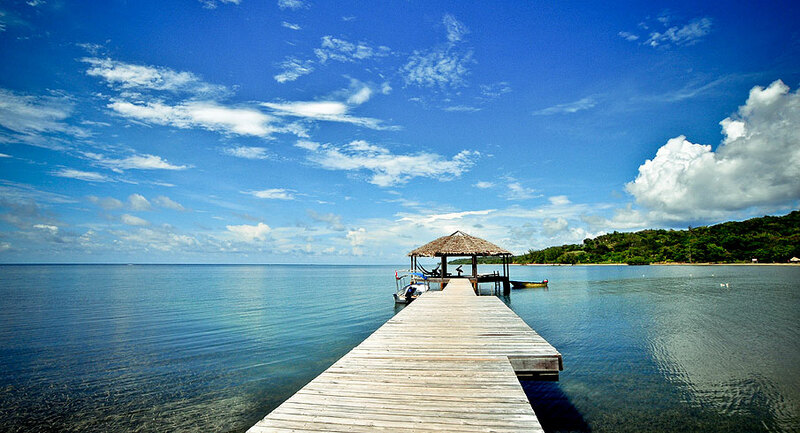 The prices were the same if not cheaper for some things we were looking for to furnish our villa in Roatan. After shopping, we stopped for some gelato at a stand in the center courtyard. We also saw a bar/restaurant there too. Mahogany Bay also has its own beach with a chair lift down to the beach. You can also walk down. We did not check out the beach but from the pictures, it looked really nice, a lot nicer than some other ports I have seen. I am not sure if non cruise ship passengers can use the beach as I sent an inquiry to Carnival, but they never responded. They also offer zip lining right on the premises too. Next time, when you need a break from the sun, or it is raining and you are looking for something to do that doesn't cost anything, stop by Mahogany Bay and take a look around. You will be pleasantly surprised. 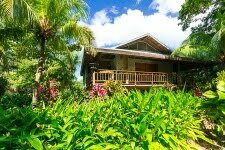 Mahogany Bay is only a short drive from the Resort at Palmetto Bay and the Tropical Garden Villa, a 3 bedroom, 2 bath villa for rent.